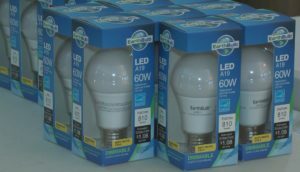 The Houghton Energy Efficiency Team is distributing LED light bulbs at no charge to Upper Peninsula Power Co. customers who meet income guidelines. Income guidelines range from $23,340 for a single person up to $80,180 for a family of eight. The LEDs, which are provided by Efficiency United, use only one-sixth the energy of conventional incandescent bulbs and last up to 20 years. HEET will give eight LEDs to those living in single-family dwellings and five to apartment dwellers. To pick them up, bring an UPPCO bill and proof of income to the HEET office in downtown Hancock any Thursday between 4 and 8 p.m.
To see the income guidelines, visit www.newpowertour.com/led-program. If you have any questions, contact Melissa Davis, melissa@newpowertour.com, 906-281-5986.